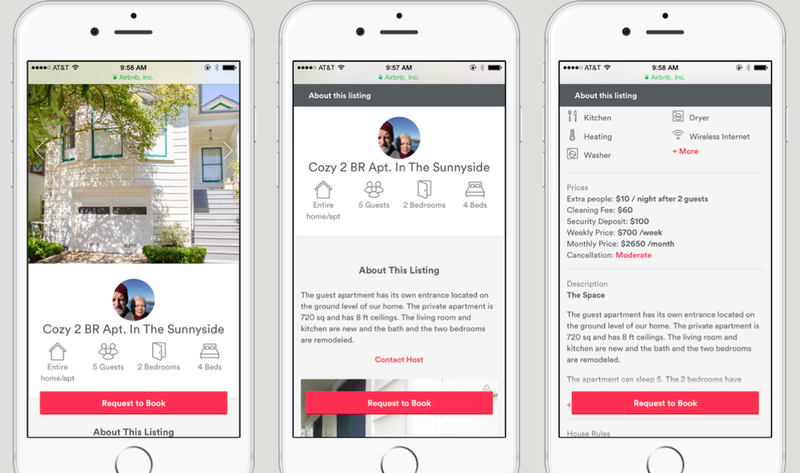 Global hospitality startup Airbnb is launching a major update to its mobile web experience today in an effort to reach more users accessing the site on their smartphones. The update not only will make the mobile site more attractive and usable for potential guests, but will also make future development easier as Airbnb moves to more responsive design. With the update, Airbnb is hoping to improve the user experience for what is today a small but growing number of users. The company says that about 20 percent of its web traffic today comes from mobile devices, but that will no doubt increase as more users become comfortable with not just browsing but also booking reservations on their mobile devices. Airbnb has mobile apps many existing guests are familiar with for that use case. But for those who aren’t already Airbnb users, the update will provide a better introduction to its marketplace of places to stay. It will also provide a more consistent experience for those who later re-visit the site or book a stay through their desktop browser. To that end, one of the main focuses for Airbnb has been on cleaning up the presentation of its homepage for mobile users. It’s done this by scrapping the utilitarian search function that existed there before and instead introducing more attractive, full-bleed images to invite users to browse listings while also highlighting potential destinations. It’s also updated its search page to make finding a place a bit more intuitive. Meanwhile, corresponding results are presented with large images and accompanying descriptions to make them seem more appealing than the tiny thumbnails mobile users were previously greeted with. Finally, Airbnb has re-done its mobile listing pages to make them more intuitive and easier to book. That starts with (again) a big image highlighting the space and an easy-to-understand legend of details above the fold. As a user scrolls down, they’ll be able to learn more about the listing and the host, but the ‘Request To Book’ prompt stays fixed at the bottom of the page. The mobile web update is aimed at not just getting users to browse listings, but also to book a place. That’ll become increasingly important, especially since mobile web lags behind both apps and desktop in conversion rate. While the update was designed to court more mobile visitors into becoming users of the marketplace, the effort is more than just a cosmetic change on the part of the company. With the change, Airbnb is aligning development of its mobile web experience with that on the desktop. From an engineering perspective, that means removing the classification between the two and making its mobile web team just a part of the overall web development organization. That means when developing new products or features, they will be made available without having to develop separately for each use case. Designer’s guide to creating a lean persona template — you’re just a few steps away from a speedier, lighter design process! By observing a sample audience, finding a source of tension, and testing your hypotheses, you can land on a true human insight. Design Thinking: an enabler for social innovation? Blockchain. You’ve heard the word. Perhaps you’ve invested in a digital currency or two. But do you really know what the technology is and why it matters? Mobile design can be a tricky subject, with many things to consider when creating a mobile app. To simplify the task, I’ve prepared some highly practical tips on what you should and what you shouldn’t do when designing a mobile app. Keep them in mind as you’re designing your app’s experience.